The proprietor of this adventure in collecting is Neil Rochmis, who runs the business with Franklin’s village mayor, Tom Briggs. And it is Rochmis who can usually be found sitting behind a counter, Friday through Sunday, noon to 5 p.m., playing scrabble on his laptop, talking to his dog, Sidney, or explaining the provenance of an unusual item to a potential customer. Rochmis is something of an adventurer himself. He grew up in suburban Long Island, the only child of a father who worked for the FAA at Idlewild (now JFK) Airport and a mother who was a sculptor and wood carver. He came of age in the late 1960s, dropped out of college, avoided Vietnam (the Army didn’t want him), and took to the open road with a buddy in a rattletrap VW van. So how did a ‘60s hippie get into the antiques business? His adventurous streak, once again. By the mid ‘80s, he had sown the proverbial wild oats, returned East and become a Registered Nurse, married Susan, a social worker and visual artist, had a couple of kids. By 1985, Rochmis and his family lived in Delhi village. One day, poking around in his back yard, he came across a blue glass bottle, circa 1930, sticking out of the earth. Then another and another. Soon he had a collection. “I got into it,” says Rochmis. He began going to auctions and renting display space, first in a bygone movie theater in Margaretville, then at the back of a Delhi health food store. He called his business Will E. Dicker. 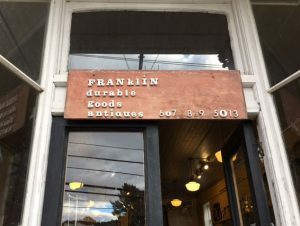 That eclectic taste pervades the Franklin shop, filling about 2,000 square feet of a building bought by Rochmis in 2004. The painted metal tiger once adorned a miniature golf course – the golfer would putt between the tiger’s legs. The eel spear (since sold) belonged to a man who catches and smokes eels in Hancock, NY. 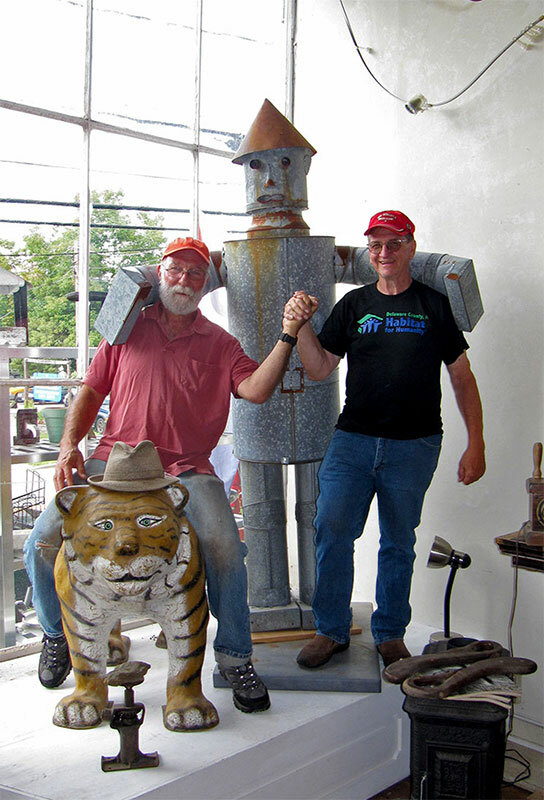 A discovery of which Rochmis is particularly proud occurred in 1998, when, at Lettis Auction, he came across rough wood carvings by an untrained artist named John Byam, who had spent most of his life in a trailer park owned by his parents. Using scrap wood, Byam had carved hundreds of “crude but complicated” figures that “blew my mind,” says Rochmis. He bought the whole lot and kept them, unsold, for years, until, in 2012, a friend saw them and organized an exhibit of the 82-year-old Byam’s work at SUNY Oneonta. That led to an exhibit at a Manhattan gallery specializing in “outsider art.” Byam’s carvings sold for several thousand dollars apiece. For Rochmis, the real reward was the pleasure of seeing his instincts validated and Byam’s work appreciated. He is the first to say that his and Briggs’ shop does not have a commercial attitude. The most Rochmis has ever received for an antique, he says, was $2,500 for a corner cupboard. He had bought it for $100. Indeed, Rochmis describes the business as “one step above selling on the sidewalk.” Potential customers wander in and out – the popularity of the Tulip and Rose restaurant, across the street, draws browsers to both Franklin Durable Goods and Blue Farm Antiques, several doors down Main Street. But it’s the rental apartment on the second floor of Durable Goods that pays the taxes and insurance. Rochmis seems to like it that way. Retired now after seventeen years at Oneonta’s Fox Hospital, where he worked as a nurse in the psychiatric unit, he lives with his wife on a former dairy farm near Treadwell. He relishes the beauty of upstate New York and the pleasure of buying quirky items that he knows someone, someday, will want.